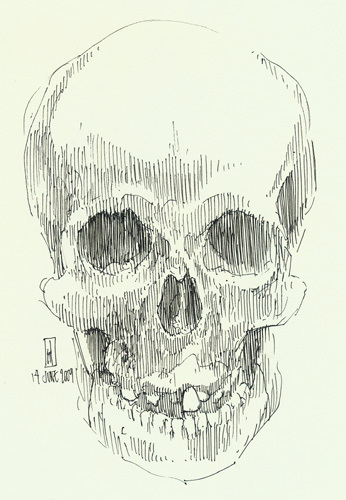 This is a portrait of the skull of Mary Ashberry, an achondroplastic dwarf who stood 3’ 6” tall. In 1856, Ms. Ashberry was working as a prostitute in New Orleans when she became pregnant in the course of pursuing her trade. Tragically, Mary's pelvis was too contracted to allow the natural birth of her child and they both died in the attempt. For many years Mary's skeleton was exhibited at the Mütter Museum with the skull of her stillborn infant placed in her open hand. One supposes this was intended to plainly illustrate the conflicts of scale in her situation. However, in the process of trying to be clinically illustrative, this display becomes a classic example of how such models often come across as chillingly insensitive to the human drama that shaped the patient's life and death.